This masterpiece of a home skillfully combines high-performance technology with exquisite integration. Reprinted courtesy of Electronics Lifestyle magazine. When it comes to home automation, there are homes that do it well and there are homes that take it to another level, elevating the home itself to a work of art. This home falls in the latter category, with the homeowner’s top goal being high performance yet totally discreet technology with an emphasis on interior design and architecture. The homeowner loves music and technology, and wanted home systems to be hidden but not at the expense of exceptionally high performance. The home features AV, security, climate, shades, lighting, pool control, sprinkler, pool safety, VOIP, network and access control just to name a few systems. It has an impressive 52 video zones, 96 audio zones, 370 motorized shades, 54 discrete climate zones, and the list just goes on. Every TV in the 52-zone video system is hidden when not in use and can display up to four sources simultaneously, great for sports events in the game room and media room. Additionally, each room features high-end in-wall speakers and a dedicated hidden subwoofer. Larger in-ceiling speakers were faux painted to blend into the environment. Every TV in the 52-zone video system is hidden when not in use and can display up to four sources simultaneously great for sports events in the game room and media room. Additionally, each room features high-end in-wall speakers and a dedicated hidden subwoofer. Larger in-ceiling speakers were faux painted to blend into the environment. 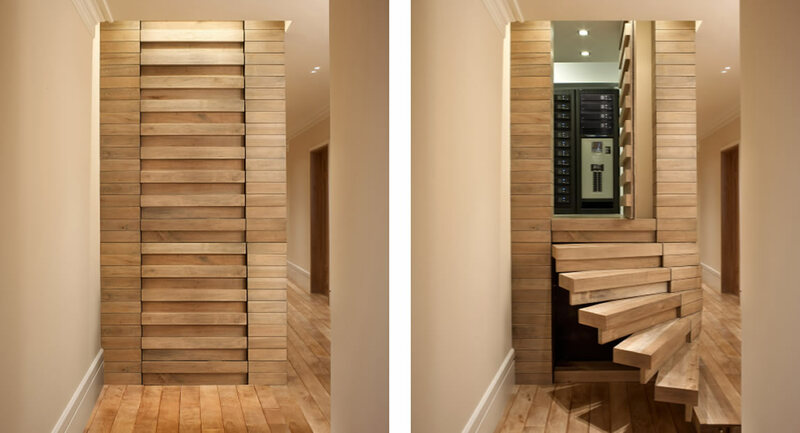 A staircase swivels out to reveal the doorway to the hidden, access-controlled equipment room. Another stunning feature is that the entire exterior of the home can be enclosed with hidden motorized insect screens, and a 40′ long, 10′ tall glass wall which is automated to open/close and ascend/descend at will. 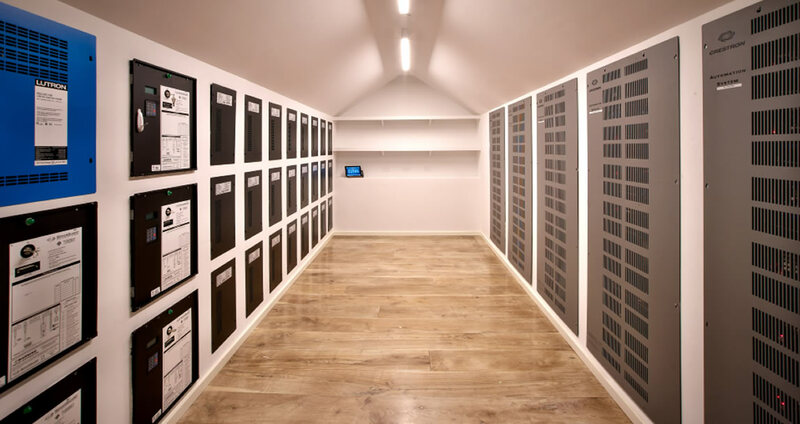 The scale of the equipment in the room is also impressive, with 12 full-size equipment racks (there are 23 total on the property) and approximately 50 in-wall electronic panels of various types. When you have high-end equipment in your home, it’s important to safeguard it. That’s why the equipment room is accessible only via access control, hidden behind a wooden wall with a hidden door that slides in and a hidden staircase that swivels out. 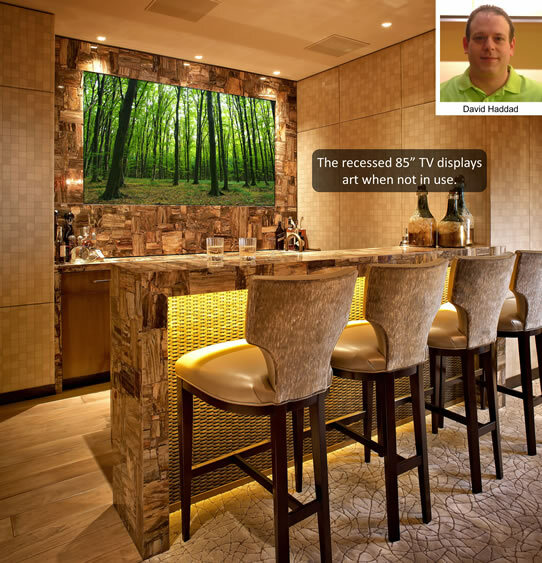 There are no less than 15 motorized TVs throughout the home that are completely hidden from view when not in use. This one, in the billiards room, features art when the TV is not in use. The mechanism swivels 180 degrees to reveal the TV. Mark Andrews, an independent project manager for this home, was tasked with not only finding the contractors, including Vidacom, but liaising with the client to ensure his vision was realized. He was the client rep and project manager for all the technical systems in the house, designed all the IT systems, and was the “glue that pulled it all together,” says Haddad. The massive amount of trade coordination that Andrews was responsible for was certainly a challenge, rivaled only by the 15 or more completely hidden motorized TVs throughout the house. Most challenging and notable are the custom hidden TV in the billiards room and the in-ceiling model in the master bedroom. “Each room presented its own challenge for hiding these TVs,” says Andrews. The master bedroom, for instance, features a wall of windows facing an ocean opposite the bed. Vidacom worked with Andrews to design and install a TV in the ceiling. Motorized mechanisms had to be silent so as not to wake anyone up when going up or down. Andrews worked with the cabinet maker, Vidacom, and the architect to achieve these goals. “The TV comes down, turns toward the bed and is tilted at an angle so that you don’t have to strain to watch it”, says Andrews. To achieve that ease of use, Haddad took a lead role in the integration of a comprehensive Crestron system that features a gorgeous and intuitive GUI that delighted the homeowner. In addition to the audio-video, all the security systems had to be managed by Crestron, and Vidacom was key in making sure the security system was included in that, taking the vision through to the end. Although the system is extremely complex on the back end, ease of use and reliability is exceptionally high. Every aspect was designed for redundancy and reliability to meet the homeowner’s demands. 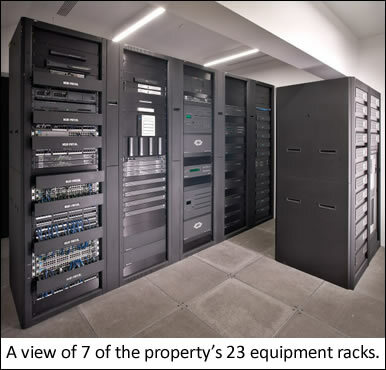 For example, each component throughout the house is powered via a dedicated 200-amp power rack located in the equipment room, making it so that each individual component can be monitored and remotely rebooted. That means less time spent on the site and less time spent engaging the busy homeowner, a win-win for everyone involved. While it wasn’t easy, the trades, project manager Mark Andrews and Vidacom succeeded in creating a home that is more than the sum of its parts. It’s integration, elevated to the level of art.